In his Wolfgang Iser Lecture 2011 literary critic J. Hillis Miller delivered a compelling argument not only for the indispensable role of literature but also for the invaluable contribution of literary criticism to contemporary society. His lecture contained an appeal to academics to engage with the complex question of socio-economic inequalities on a global level. At this year’s Wolfgang Iser Lecture, the renowned literary critic J. Hillis Miller, a long-time friend and colleague of Wolfgang Iser at the University of California, Irvine, addressed the fundamental question of the value of literature in and for contemporary society. "What good is it in these bad days to read literature at all? ", Miller asked at the opening of his lecture, referring to the tight economic and social situation in the USA. Through its creative and formative power fiction can bring out inward images, give them shape, uncouple them from internal anxieties and externalize them as ‘other’. Miller’s choice of the skeptical apartheid novel Waiting for the Barbarians by the Nobel laureate South-African author J.M. Coetzee to illustrate his point is in this sense an appropriate literary paradigm. Miller based his discussion on Iser’s groundbreaking theory of fictionalizing acts in The Fictive and the Imaginary, which emphasizes the importance of the “imaginary” as a third term between the poles of reality and fiction. Through the imaginary, Iser argued, literature transgresses the boundaries of the real and becomes a crucial means of promoting “limitless human self-cultivation”. This served as a preliminary approach to Miller’s question. At the same time, the lecture aimed at showing where Iser’s own theories prove insufficient to deal with this important topic. The notion of the fictive is both an exclusively human potential and a universal faculty, independent of time, place and culture. Miller began by offering a gripping interpretation of Iser’s opening chapter of The Fictive and the Imaginary that placed his work in a new light. Leaning on Walter Benjamin’s distinction between das Gemeinte (what is meant) and die Art des Meinens (the way meaning is expressed) – which Paul de Man translated into the irreconcilable realms of “hermeneutics” and “poetics” – Miller’s reading of Iser both served to elucidate some of the key Iserian terms and to explore the unique modes of explanation chosen by Iser to convey his ideas. “We read because literary texts provide us with imaginary worlds that make us capable of fusing various levels of the real”. As for Iser’s poetics, Miller focused on the way in which The Fictive and the Imaginary can itself be read as a fictionalizing act in the Iserian sense. Miller brought to light notable “rhetorical procedures” in Iser’s text, such as the abundance of spatial figures of speech that encourage the reader to actually visualize the realms of the real, the fictive and the imaginary as “spatial fields in constant ‘kaleidoscopic’ transformation”. Furthermore, Miller’s analysis stressed the importance of terms related to transgression in Iser’s text, suggesting that the fictionalizing act not only involves a crossing of boundaries – to be understood as a movement to and fro between the real and the imaginary in an unending process – but it is in itself essentially “a violent and illicit act”. This sense of covertness and danger turns Iser’s own arguments into a fictionalizing act, because they translate and transfer the “overt meaning” of hermeneutics into an imaginary space which is offered to “the reader’s spectatorship” as a space of transgression. It should be noted, however, that this does not involve a one-way movement, but rather a movement in “waves” or sinus-curves. Based on this remarkable discussion, the second part of the lecture proposed an application of Iser’s ideas about the transgressing power of the imaginary to the reading of J.M. Coetzee’s novel Waiting for the Barbarians. Interpreting Coetzee’s disturbing novel as an indictment of imperial conquest that can be applied to a variety of contexts from the South-African Apartheid to the more recent abuses and “ideological misconceptions” of America’s so-called war on terror, Miller emphasized the importance of literature as a critical reflection on reality. Here Miller introduced a political dimension that is actually absent from Iser’s reflections, and that draws on his own reflections about American contemporary reality. According to Miller, it is the very “pragmatization of the imaginary” in the themes of imperial violence, paranoia and “interminable waiting” that makes Coetzee’s text resonate powerfully with readers, even though what it presents is only an “as if” world and not the real world itself. It is the very “pragmatization of the imaginary” in the themes of imperial violence, paranoia and “interminable waiting” that makes Coetzee’s text resonate powerfully with readers. At the same time, Miller stressed the “need to go beyond what Iser says”. While the ideas advanced in the first chapter of The Fictive and the Imaginary illustrate the level of das Gemeinte, they have less to say about the importance of language, or the Art des Meinens, in Coetzee’s novel. The final section of the lecture was therefore dedicated to a more detailed exploration of how meaning is expressed in Coetzee’s text and the implications this has for the reader’s imagination of the narrated events. Miller highlighted the ways in which the violence depicted in the novel is enhanced by the use of a first-person narrator and the present tense. The implication of the narrator in the brutal acts of the empire suggest that any individual can become complicit with acts of violence – an argument that Miller reinforced by referring to the passive involvement of Americans (and by implication also Europeans) in the wars arguably fought for them in Iraq and Afghanistan. Miller also noted that Coetzee’s novel produces an “equation between sexual conquest and political conquest by torture”, and that both essentially lead to failure. The desire of the protagonist to possess a barbarian girl remains as unfulfilled as the empire’s aim of controlling the barbarians. In Coetzee’s narrative, “the other person remains implacably other”. “The meaning and the art of meaning” in Coetzee‘s novel are “incompatible”. 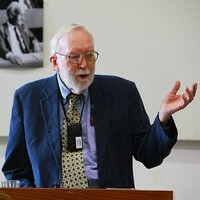 As in the case of his reading of Iser, Miller concluded his discussion of Coetzee by noting that “the meaning and the art of meaning” in the novel are “incompatible”. The reader is encouraged to extrapolate the novel’s fictional plot to a known reality, yet simultaneously the rhetorical means employed by Coetzee suggest that, like the novel’s protagonist, “we can learn nothing”. However, following the pattern of the whole lecture, this rather cheerless conclusion has a twist. As Miller suggested, there is a distinction between the protagonist’s trapped position and the “ironic distance” of the author, Coetzee. Waiting for the Barbarians leaves it up to the reader to identify with the characters and events or to distance him/herself from them. In this sense, the novel indeed stimulates the plasticity of human self-cultivation. The same could be said of Miller’s lecture: by pointing out the significance as well as the contradictions of both Iser and Coetzee, it delivered a compelling argument not only for the indispensable role of literature but also for the invaluable contribution of literary criticism to contemporary society. Whereas Iser’s notion of the imaginary as a timeless, limitless, borderless, “oceanic” realm stressed fiction’s universal value, Miller takes fiction’s capacity to enable human faculties more pragmatically and applies it to current issues affecting the lives of his native Americans as well as of people all over the world. On the theoretical level, then, Miller attributes more importance to the historical and social context of literary texts and their reception than Iser did. At the same time, the question "What good is it in these bad days to read literature at all?" contains a strong ethical core and an appeal to academics to engage with the complex question of ongoing – perhaps even rising – socio-economic inequalities on a global level. By drawing close parallels between Coetzee’s disturbing novel and the horrifying details of the wars in Afghanistan and Iraq and the atrocities committed by American soldiers in Abu Ghraib, this year’s Iser lecture proved just how vital reading and thinking about literature remains for our age. PD Dr. Monika Reif-Hülser teaches at the Department of Literature, University of Konstanz. Dr. Ana Sobral is scientific associate at the Department of Literature, University of Konstanz. Should We Read Literature Now, and, If So, How? J. Hillis Miller: Grenzgänge mit Iser und Coetzee. Literatur lesen – aber Wie und Wozu? Übersetzt von Monika Reif-Hülser. Konstanz: UVK 2014 (= Konstanzer Universitätsreden, 246). Prof. Dr. Dr. h.c. mult. J. Hillis Miller ist Distinguished Research Professor for Comparative Literature an der University of California, Irvine. Hillis Miller hat zusammen mit Wolfgang Iser eines der einflussreichsten Zentren für Literaturtheorie an der Universität Kaliforniens in Irvine ins Leben gerufen. Prof. Miller hat zusammen mit Jacques Derrida an den Universitäten Yale und Irvine gelehrt und mit seinem Werk die Entwicklung der Literaturwissenschaft in den USA stark beeinflusst. Im Zentrum seiner Arbeit stehen die Offenheit des Textes und der Prozess der unabschließbaren Lektüre.